The Heritage Centre is a 2 minute walk from the Market Place in the centre of Wirksworth, and a 5-10 minute walk from Wirksworth Railway Station (if arriving by train on Ecclesbourne Valley Railway). Pay and display parking is located on the town’s Market Place, and time-limited on-street parking is available on St.John’s Street near the Heritage Centre itself. A free car park can be found on nearby Canterbury Road opposite Anthony Gell School, and additional unlimited on-street parking is also available in this area. Wirksworth is served by two bus services – the ‘sixes’ travelling between Derby and Bakewell and the 110-111b between Matlock, Ashbourne and Wirksworth. Coaches are advised to drop-off and pick-up groups on St. John’s Street. 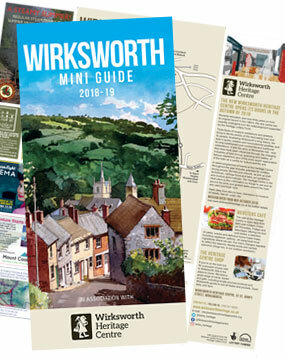 Thank-you for subscribing to the Wirksworth Heritage Centre newsletter. 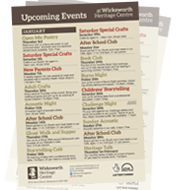 Sign up to receive regular news from Wirksworth Heritage Centre and be the first to find out about forthcoming exhibitions and events. We value your privacy and promise never to pass your details onto third parties.